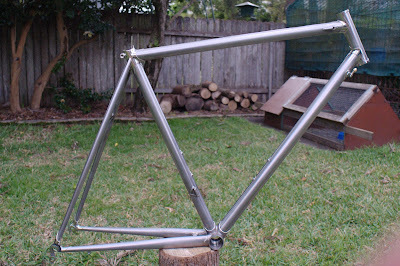 Suzy's Blog: Number six ready for paint. 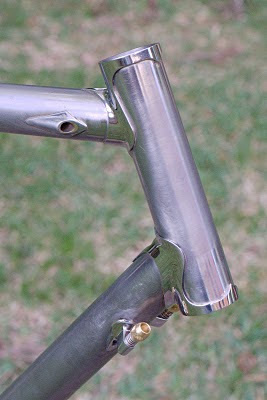 Keith's new frame is polished up and ready for paint-prep. 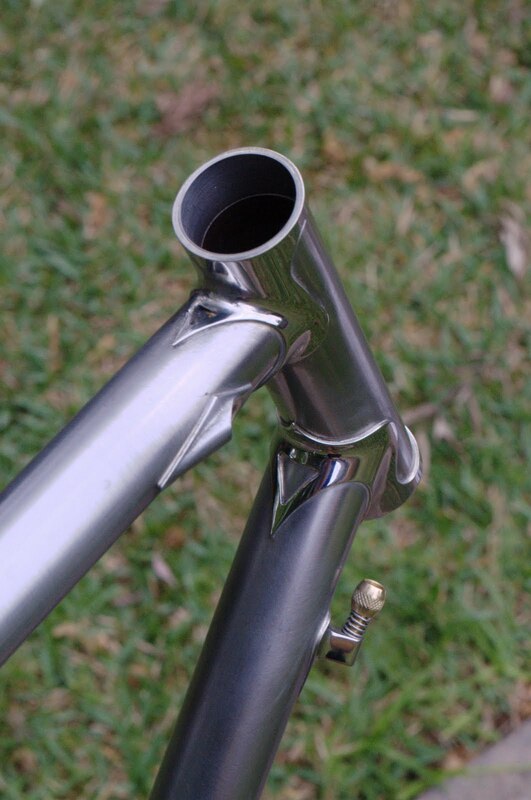 It's built with Columbus Spirit for lugs tubes in OS size, with traditional level top tube. 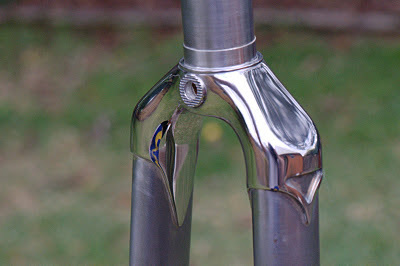 It measures 56.5cm long by 53cm high, to suit Keith's relatively short legs and long torso. The frame is built for road racing, with 73 degree seat tube and 72.5 degree head tube. 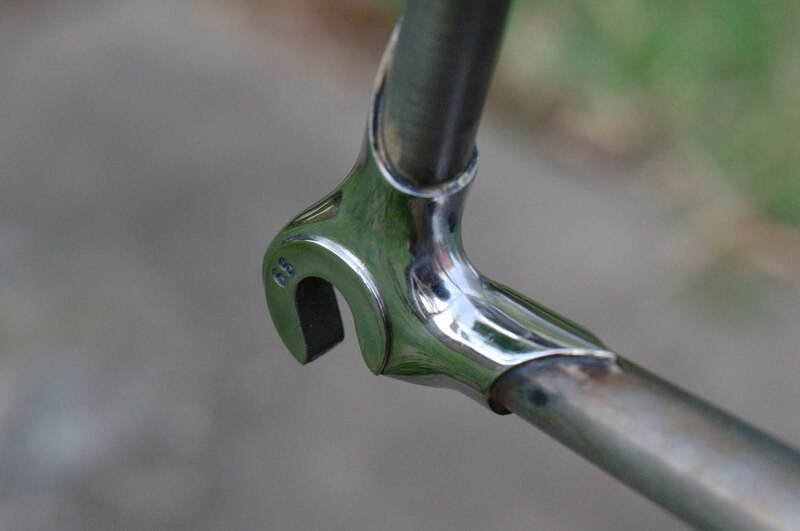 Lugs are Llewellyn's custodian, in stainless, with substantial modification and customisation. Firstly some non-stainless content. 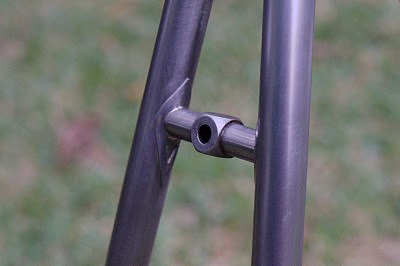 Here's the only plain steel lug on the bike - the bottom bracket shell. 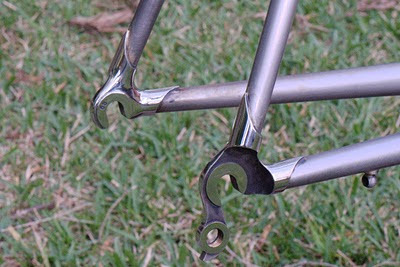 It's an Everest part, which originally had a cast-in chainstay bridge. Given that Keith is a pretty powerful guy, I removed the standard bridge and put a much beefier one in, using a section of seat stay. 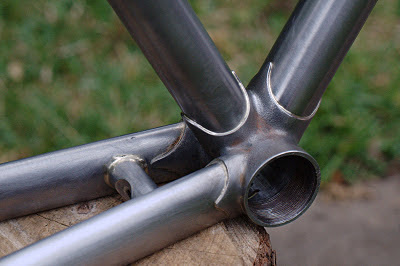 I wanted to put it as aft as possible for maximum rigidity, so I scooped out a section using a file to provide a bit more tyre clearance, and filled it in with a down-tube offcut, brazed in with brass so that it didn't fall to pieces when silver brazing the chainstay bridge to the frame. It should be really stiff. 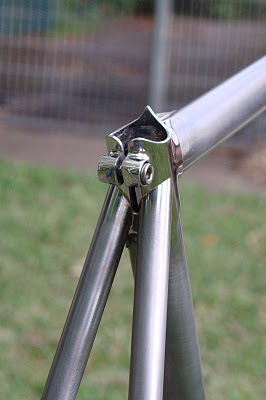 The front derailleur tab is a Richard Sachs one, again in stainless. These things are just so cool it's incredible. 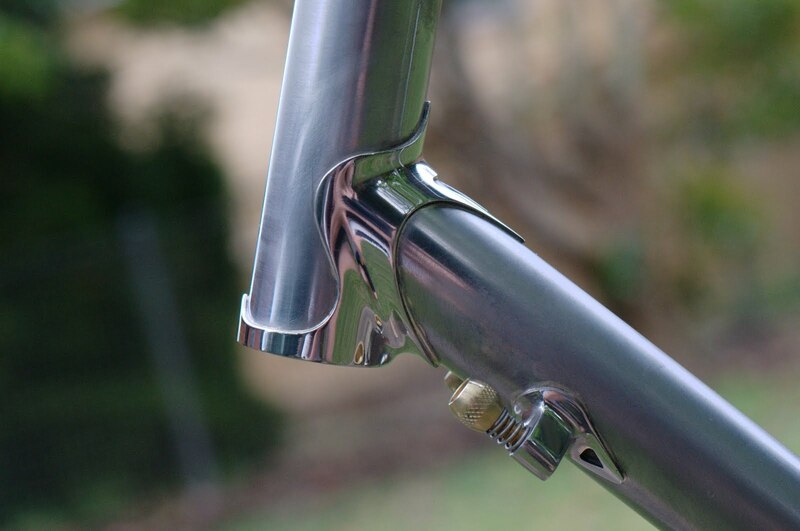 Here's that seat lug, polished to a mirror finish. 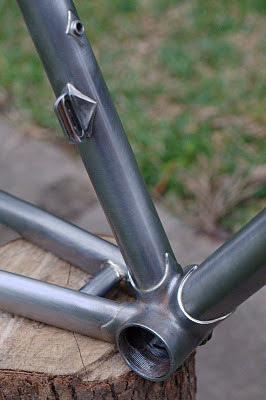 I know I said previously that I wouldn't do another, but I'm already plotting my next one. Will I ever learn? The hardest bit to polish was between and under the seat stays, as I couldn't get a polishing mop in there. I did this by hand, using strips of cloth and Brasso. 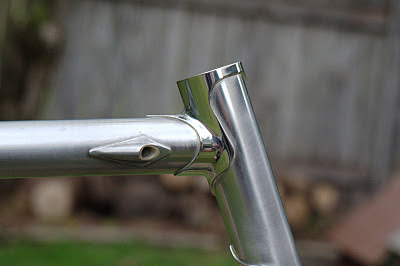 The head lugs look really classy, I think. 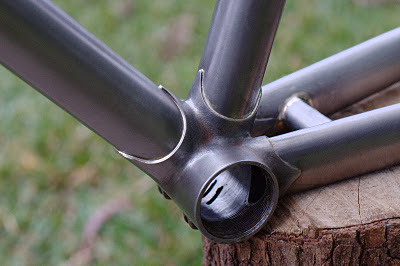 I put Bocama-esque cutouts in all the lugs, to make them look a little less heavy. I took a huge amount of material out of the top head lug around the front to lighten it, and removed the ergo cable stops from the lower head lug. 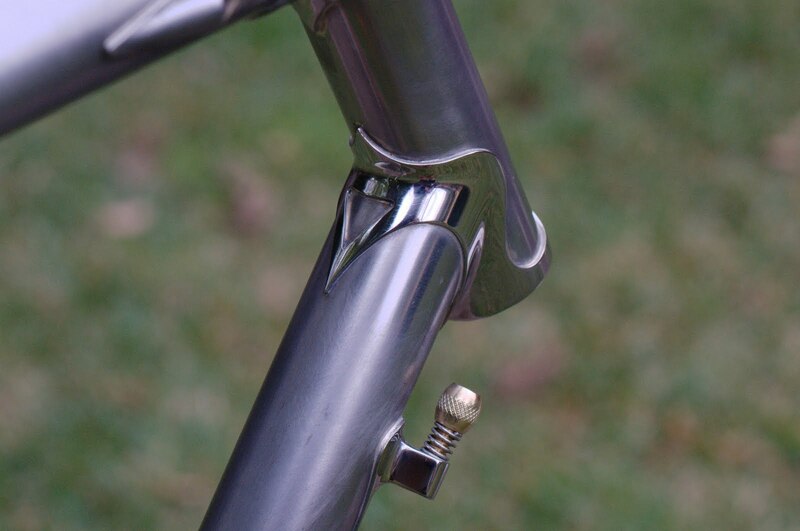 I used Llewellyn's downtube-mount cable stops instead, which both look much cooler and ensure there's no interference between front brake and gear cables. 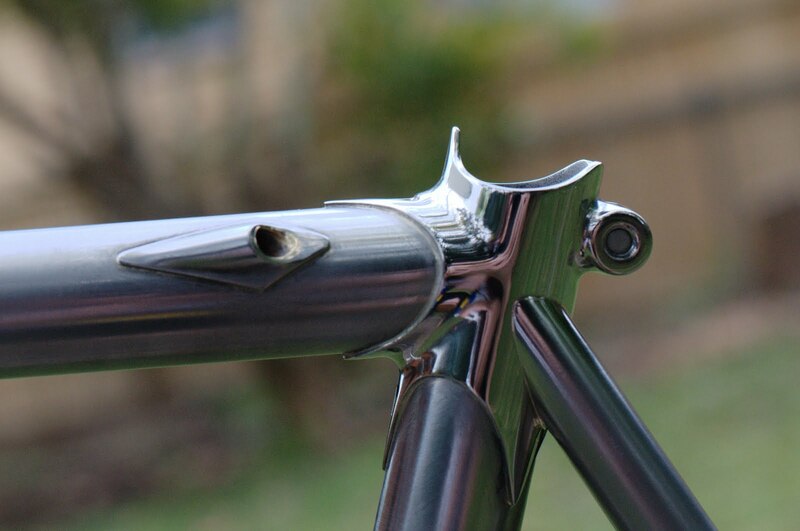 Of course it's all polished to a mirror finish, to showcase my obsessive compulsive disorder. 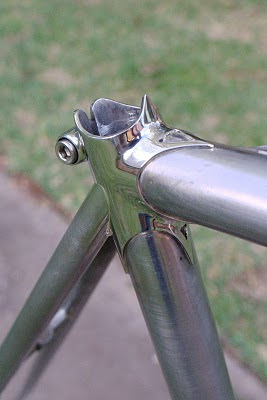 The dropouts are Llewellyn stainless, to match the fork. Again, polished to a mirror finish. 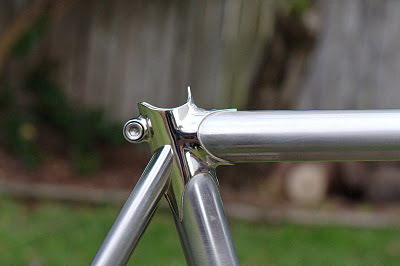 This is actually the second brake bridge on this frame - I wasn't happy with my first go, so cut it off and tried a second one. This frame has been quite a bit of work, but I think the results are really worth it. Number six looks sensational Suzy! Great job. I'm looking forward to seeing it built up. Cheers, Cam "Velorini" McCarthy.